I don't mind either scenario (I would rather give the car the right of way, personally). Can anyone say definitively what a driver should do when there's a biker (mounted) waiting at the edge of the crosswalk? The fact that mounted bikers are not considered "pedestrians" is why I'm confused. Pedestrians and unmounted bikers have the right of way without question here, I think, because of the wording of the sign. By the way, this is in Boulder, Colorado, USA, in case this is one of those "varies-by-locality" situations. This Legal Site, seems to think that when on a pedestrian path, a bicycle rider is a pedestrian. Unfortunately, not every jurisdiction handles bike riders the same way. But, most states generally observe an interesting hybrid view of bicyclists. When riding on the street, a bicycle is treated much the same as a car. They are generally required to observe all traffic signs, signal turns, and have certain safety features like helmets, reflectors, and/or lights. When riding on the sidewalk, however, the bike becomes a pedestrian. 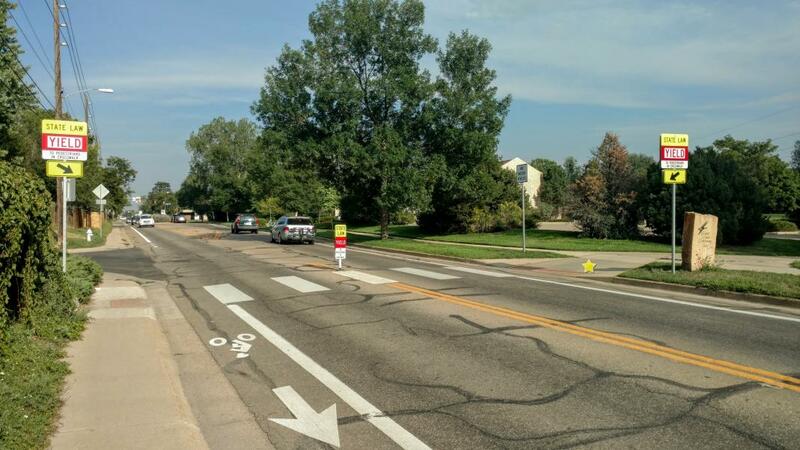 If in a crosswalk, drivers are supposed to yield to bicyclists. Bicycles are generally allowed to use sidewalks along side those on foot (unless signs state otherwise), though there may be some areas with lanes specified for foot versus bike traffic. Unfortunately, laws vary not just from one state to another, but also for different municipalities. As a result, it is important to take a moment to become acquainted with your state and local laws regarding the operation of a bicycle. Interestingly, it appears in most states that one can switch from being a pedestrian to a vehicle simply by moving from a sidewalk or bike path to a roadway. And, for purposes of liability when a car hits someone riding a bicycle, most states treat the cyclist as a pedestrian rather than a fellow driver. But it also says that different states and municipalities may rule differently on it. On a personal level, i think that drivers should yield all the same if there is a person in the crosswalk, although i realize this doesn't happen because people are rude and impatient. There are many instances where even standing in a crosswalk does not garnish a stop by oncoming traffic even though it is the law. In shared bicycle/pedestrian facilities next to a road, do I obey the pedestrian or the vehicle traffic control devices? Is it ever legal in the USA not to have two brakes on a bike? What is the best way to approach train tracks? Get off bike on crosswalk?